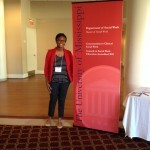 Tuskegee, Alabama, October 9th-14th – UM’s Social Work Department presented three paper sessions at the Alabama-Mississippi Social Work Conference at Tuskegee University. 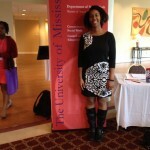 Dr. Jandel Crutchfield, visiting assistant professor, presented Enhancing Blackboard through Google+ Hangouts. As online education expands to universities across the country, social work educations and professionals sometimes find themselves using a platform limited by organizational standards. This presentation demonstrated how to enhance “chat only” virtual sessions by using Google+ Hangouts, a free, dynamic interface allowing participants to interact in real time with live video. 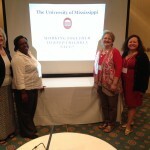 The University of Mississippi Child Welfare Training Academy (Ms. Melody Hamilton, Program Director; Ms. Angela Adams, Trainer; Ms. Patricia Digby, Trainer; and Dr. Daphne Cain, Principle Investigator) presented Working Together to Keep Children Safe where participants learned about the unique, educational partnership between the Mississippi Department of Human Services, Family & Children’s Services and the University of Mississippi Social Work Department Child Welfare Training Academy. These leaders in child welfare have joined together for the benefit of the family unit in hopes of keeping children safe in their own homes. Dr. Daphne Cain, chair of UM’s social work department, with Dr. Bret Blackmon of University of Southern Mississippi, presented Reducing Delinquency through Early Intervention: A Program Evaluation of an Elementary School Truancy Intervention. The Truancy Assessment and Services Center (TASC) is an elementary school truancy intervention that was established to address Louisiana’s record rates of juvenile crime during the 1990’s. Cain and Blackmon described this intervention, discussing its underlying theoretical framework, and reporting on a recent mixed methods program evaluation.